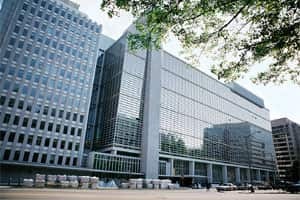 Talent hunt: The World Bank building in Washington, DC. According to the bank, only 15% of Indian firms offer in-house training, something that is offered by almost all firms in China. The Indian Institute of Technology, Kharagpur, partnered with the government and a local cooperative to redefine the way Baluchari saris are woven—it figured out how this could be done on a jacquard loom, or a loom that can create intricately brocaded fabric. The result: The time taken to complete a sari dropped from six months to a week, and the price halved. Drishtee.com, a for-profit initiative, delivers fee-based governance, education and insurance services to rural people in North and North-East India through 700 kiosks owned and operated by local entrepreneurs. The two (the IIT Kharagpur initiative and Drishtee.com) are cited as innovative efforts that target the poor, according to a new World Bank report titled, Unleashing India’s innovation: Towards sustainable and inclusive growth. Efforts such as these and the use of appropriate public-private partnerships to build on and diffuse the country’s traditional knowledge base could help multiply the national output by five times, says the report. “India’s basic knowledge is stupendous. The challenge is to make it more commercial and market-driven, using more programmes such as the New Millennium Indian Technology Leadership Initiative (NMITLI) launched in 2003," Mark Dutz, the bank’s Washington-based senior economist and editor of the report, said in an interview. Dutz called for an easier patent regime for grass-roots innovators and technology, preferably in the form of a national think tank on intellectual property rights. “Does the rural innovator need a WTO regime? Probably not. The National Innovation Foundation has a repository of more than 50,000 grass-roots innovations and traditional knowledge practices. Whether the rights should go to the association or community is something that needs to be thought through," he said. The main reason for India’s low research and development (R&D) investment, which is still languishing at less than 1% of the gross domestic product, in spite of a target of 2% by 2007, is its policy “regulatory environment that discourages risk taking", specifically, barriers to beginning and closing a business, said Dutz. Compared with Brazil, where 93.4% of firms upgraded (or made an improvement on) a product and 64% introduced one in 2003, less than 60% of Indian firms upgraded a product and only 39% launched a new one in 2006, according to a survey that the World Bank conducted last year. This happens also because the public sector, with its many overlapping arms, dominates R&D spending, accounting for 70-80% of total spend. A large part of this goes towards defence, space and energy research. Less than 18% of the amount spent on R&D is spent on civilian research. Of the country’s total R&D budget, 8% goes to the 38 labs that make up the Council of Scientific and Industrial Research (CSIR) and 9% to agricultural and medical research and science and technology. Last year’s survey says India’s public system places too much emphasis on innovations with traditional definition of “new to the world", rather than the more relevant “new to the market" with a focus on “more commercial and applied areas of public goods in industry, agriculture and health." This survey also found there was very low absorption of technology by small firms, especially in the informal sector. Almost 90% of India’s workers are in the informal economy. The availability of funds for start-ups is a significant barrier to innovation, says the new report. According to the World Bank’s Inderbir Singh Dhingra, early-stage funding accounted for only 13% of the deals in venture capital and private equity industry in 2005, although the average size of the deals went up from $8 million in 2002 to $15 million in 2005. The report adds that there is still a bias towards IT firms and proven business models. The Small Industries Development Bank of India, Gujarat Venture Finance Ltd and Andhra Pradesh Industrial Development Corp. Ltd (APIDC), along with Westbridge-Sequoia, remain the only major funders willing to make small start-up investments between $500,000 and $3 million. India also does not licence enough technology, says the report. Royalty and licence fee payments amounted to only $421 million in 2004, or $0.4 per million people, compared with $1197 million in Brazil and $3548 million in China ($2.8 per million people). Dutz says that low-level skills or even the absence of skills could prove a big deterrent to better R&D, especially with only 40% enrolment in secondary education in the country. According to the World Bank, only 15% of Indian firms offer in-house training, something that is offered by almost all firms in China.